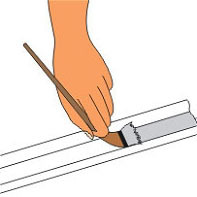 Making So Simple Crown Molding a part of your home requires only a few simple, low-cost materials and a few simple steps. Enjoy the professional look and finished style of SoSimpleCrown™. You can make a big change with a few hours of spare time! Take a look at our before and after photos. That's it, SoSimpleCrown™ is that easy. Apply the latex (water based)house paint of your choice. 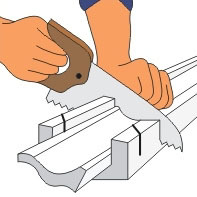 Use a miter box and simple hand saw. Power tools may also be used if available. 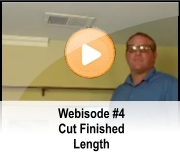 Add a bead of caulk to the molding to ensure secure placement. 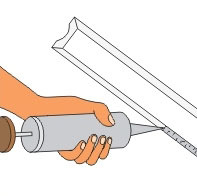 Do not over do it – the caulk is strong and needs only a single bead for full adhesion. 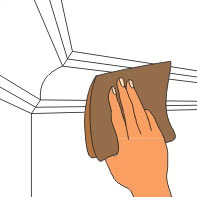 Simply wipe away excess caulk with a damp cloth. Begin by sketching your room on a piece of paper. Next measure all the walls and write in the measurements on your sketch and add up all the measurements. Add 10% to your estimate for cuts and waste. Put a Circle all inside corners and a square on all outside corners. Add up all the inside corners and all the outside corners. Now you are ready to visit our Buy Online page and select the crown molding that you prefer. Select the amount of molding in Linear Feet using the drop down menu. Next select the amount of Inside and/or Outside corners. Enjoy the professional look and finished style of SoSimpleCrown™ Make a big change with a few hours of spare time! We can ship to any location nationwide. As new retail locations are added, you will eventually be able to pick up SoSimpleCrown™ at your local home improvement store.